Do you know why this application made its way into the planning committee? Surely a councillor would have had to ‘call it in’? I can’t see where it says who called it in. Planning does not work like that. Cabinet decisions can be “called in” to Full Council, but Planning being a “quasi-judicial process” does not have the same rules. Every application has to be considered at least by the officers, if not the Committee, by law. They can’t be blocked or rejected out of hand. Simple applications do not go to a Planning Committee at all – if the officers can give it a clear yes/no then it is decided under delegated powers. A list of these is provided to the Committee at their meetings so they can see what is going on. I hear that fairly recently a planning officer made a mistake and approved an application under delegated powers that they should not have done (there had been rejection on similar applications on the same property before, but the boss was on leave and instructions were not followed) – there was no opportunity to undo that decision, unfortunately. If it is not simple, if there are objectors, if it is a certain size etc, then it has to go to the Planning Committee to determine. Yes, a councillor can ask for an application to be referred to committee, but that is not the only route (and the chances are they will be applications that are already contentious). The officers will produce a report giving their view of whether it should be accepted or rejected, and why. The basis of objections and support received is provided. RBC has very recently (far later than many other Borough Councils) allowed objectors and supporters to speak at meetings. Very rarely, for specific Planning reasons, planning matters are referred to Full Council, but this is not the result of Call In. It is more likely to be because of a major impact. As far as I can tell, the Spike Pawsey application was handled correctly up to the point of the meeting (and the LGO will apparently report on the matter soon). The allegation with the Belinda Garcia one is that improper ‘treating’ of a key officer before the application went to committee at least gives the impression that impropriety may have occurred. As far as I can tell, no all Tory councillors who should have done, declared an interest. Thanks for the info – very interesting. Do you know which elements of the Spike Pawsey application meant that it should be determined by the planning committee? 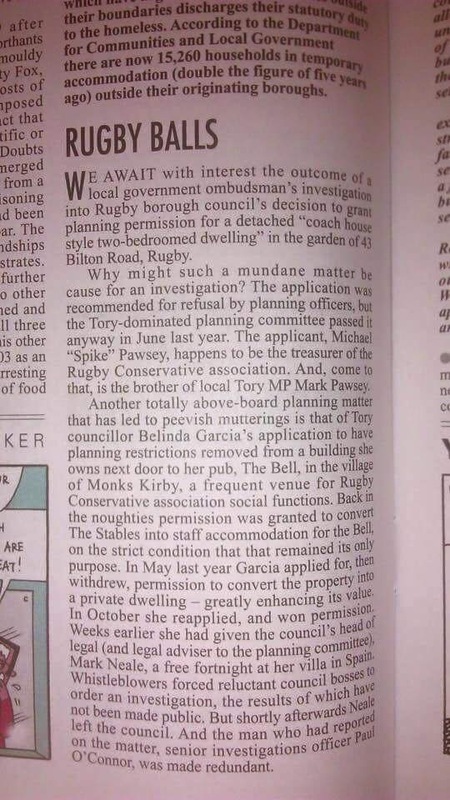 Is it because he is a prominent local Tory? Do you know whether the opposition councillors also voted for approval? Generally, refusals are more likely to be referred to a planning committee, and the Pawsey application was to be rejected on two planning policy lines. It also had several objectors and supporters. I don’t think it had anything to do with who the applicant was that it was referred. I don’t have any inside info, but looking at it referral to the committee looks routine to me. I have spoken to one opposition councillor, who I cannot name, but their answer leaves me no doubt that they did not support the move. As recorded votes were not taken, I cannot say how anyone voted. But the members concerned could.